A 16-year-old boy and a 20-year-old man, from the Qalqiliya and Salfit districts respectively, were killed in unrelated incidents in January during Israel’s war on the Gaza Strip. On January 8th, Ibrahim Abdulkarim Shamlawi, a student at Al-Quds University in Abu Dis, east of Jerusalem, but from the village of Haris in the Salfit governorate, was shot dead by soldiers at an Israeli gas station near the Ma’ale Adummim settlement. Mr. Shamlawi was reportedly very angry about the war on Gaza and went out to the gas station, with no identification but with 100 shekels in his pocket and a bottle full of benzene. He proceeded to pour the benzene on the floor of the gas station and then tried to light it. Palestinian employees of the gas station tried to stop him, and succeeded, but soldiers arriving in response the incident shot him dead rather than arresting him, said the deputy governor of Salfit. Because Mr. Shamlawi was not carrying ID, it took three to four days to identify his body, the deputy governor said. His father in Haris reported him missing after this period, and the Salfit governorate, which had information on the incident, contacted Israeli authorities, who brought photographs of the body to Haris for his father to identify. Following an autopsy performed at an Israeli medical centre, the body was returned to Haris on January 15th and buried the same day. On the night of January 13th three teenaged boys from Azzun were arrested by the army, allegedly for throwing stones on Road 55, though a cousin of the dead boy claims he was helping a friend look for strayed sheep. After being arrested, the boys had their hands tied behind their backs. 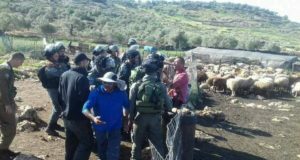 A settler on the scene – reportedly from Immanu’el settlement and the son of the former mayor – is said to have then beat to death one of the boys, Nasser Mustafa Daoud Audh, age 16, by hitting him repeatedly over the head with a blunt object. The other two boys were arrested and reportedly taken to the jail at the IDF base near Huwwara, Nablus district. 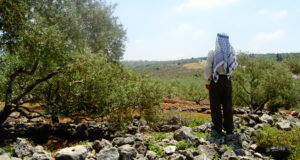 The cousin said Nasser’s body was taken to Qedumim settlement, where his father went to claim it the following day. He was reportedly asked to sign two forms, both in Hebrew. One was a consent form for organ removal, and the other was said to have been a form agreeing not to press charges against the settler, who was then freed. The father had apparently not understood the nature of the second form when he signed it, as he cannot read Hebrew and it was not explained to him. Nasser’s body was returned to Azzun on January 15th for burial, following an autopsy and organ removal. 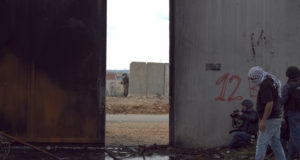 However, the Israeli army, returning the body at around 5 p.m., reportedly opened fire with rubber bullets on boys near the entrance of the village who were said to have been throwing stones at the army vehicle. The army also reportedly lobbed tear-gas canisters, and seven boys were said to have been injured in the incident. The family waited for several hours for Nasser’s body to be returned, as the army then took it away again following the incident. Just before 8 p.m. mourners were told the body would not be returned until the following morning, though it was finally returned to the family after 9 p.m. for the funeral.